Single use bath salts drug test dip! 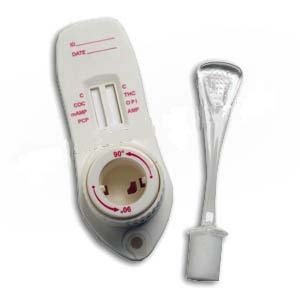 One Step Bath Salts Urine Drug Test Strip. Bath salts is a term used in North America to describe a number of recreational designer drugs. The name derives from instances in which the drugs were sold disguised as true bath salts. The white powder, granules, or crystals often resemble true bath salts such as Epsom salts, but are very different chemically. The drugs' packaging often states "not for human consumption" in an attempt to circumvent drug prohibition laws. Bath salts have also been similarly disguised as plant food, hookah cleaner, and other products, despite only seeing regular distribution in shops selling drug paraphernalia. Synthetic cathinones such as mephedrone, which are chemically similar to cathinone, naturally found in the plant (khat), were first synthesised in the 1920s. They remained obscure until the first decade of the 21st century, when underground chemists rediscovered them and began to use them in designer drugs, as the compounds were legal in many jurisdictions. In 2009 and 2010 there was a significant rise in the abuse of synthetic cathinones, initially in the United Kingdom and the rest of Europe, and subsequently in the US. Drugs marketed as "bath salts" first came to the attention of authorities in the US in 2010 after reports were made to US poison centres. In Europe, the drugs were predominantly purchased from websites, but in the US they were mainly sold in small independent stores such as gas stations and head shops. In the US, this often made them easier to obtain than cigarettes and alcohol. Bath salts have also been sold online in small packets; some of the brand names used are "Purple Wave," "Zoom," and "Cloud Nine." Hundreds of other designer drugs or "legal highs" have been reported, including artificial chemicals such as synthetic cannabis and semi-synthetic substances such as methylhexaneamine. These drugs are primarily developed to avoid being controlled by laws against illegal drugs, thus giving them the label of designer drugs. The number of calls to poison centers concerning "bath salts" rose from 304 in 2010 to 6,138 in 2011, according to the American Association of Poison Control Centers. More than 1,000 calls had been made in 2012 by June. Bath salts can be ingested, snorted, smoked, or injected. Injection is especially ill-advised as these products rarely list ingredients, let alone dosage. Bath salts are known to be detrimental to human health and have been known to cause hallucinations.